At G&M Services, we are concrete core drilling experts. With our experience and our commitment to quality, you can trust G&M Services for all of your concrete core drilling needs. We strive to offer not only efficient and professional service but also a level of quality you can trust. The prices of our concrete cutting services reflect the level of safety and experience that a project needs in order to get the task done correctly. Our price may not always be the cheapest in the industry, but we guarantee our price with no additional upcharges. We honor the price we give you with no additional costs unless a large unforeseen issue arises. For over 25 years, G&M Services has been performing concrete core drilling services throughout the Washington, D.C., Maryland, Baltimore, Pennsylvania, and Virginia areas. Our experience allows us to provide top quality service so you can trust that we will complete any concrete core drilling project correctly and efficiently. What is concrete core drilling? 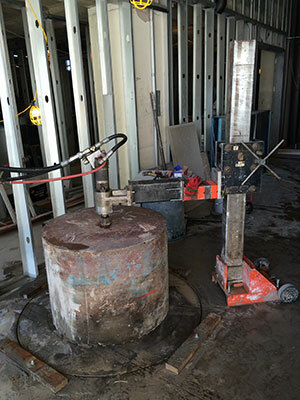 Concrete core drilling involves removing a cylinder – called a core – of material from a wall, floor, or ceiling. Concrete core drilling can be called for in a wide variety of applications, such as plumbing, HVAC, cabling for indoor and residential projects, roadway and slab holes for drainage, rebar tie-ins, and doweling drilling for industrial projects. 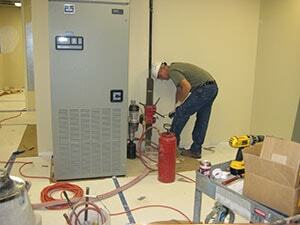 It can also be used for quality analyses of materials and to allow for the installation of recessed lighting. Concrete core drilling services can be used to create new pipe penetrations to provide access for a wide variety of applications, from plumbing to steamfitting to electrical work. Unlike traditional methods that stir up dust, we use a wet cutting method that accurately and efficiently prevents the release of harmful silica into the air where it can cause serious health concerns for workers and passersby. We take the safety of our employees seriously as well as others in the field, which is why nearly all of the services we offer are dust-free. We boast an unlimited selection of drill bits over ½,” allowing us to manage even the most seriously heavy-duty concrete core drilling jobs. Our 56” bits are large enough to be used for wastewater treatment piping and similarly large-scale projects. Our selection of electric, diesel, hydraulic, and gas concrete core drilling equipment provides the flexibility needed to get your job quickly, efficiently, and on time.